There’s a lot of crap in this world. Politics are getting more and more vicious every day, war and terrorism make the future look bleaker, and that giant island of plastic and garbage in the middle of the Pacific will probably soon reach all the way to the beaches of the mainland. Taking pictures of stuffed animals in everyday situations makes me laugh. Maybe it will make someone else laugh, too. When I was a child, I believed my teddy bear, Tim, was real. Not in the sense that he was an actual bear who lived in the woods or anything like that, but that underneath his manufactured fur he had real emotions and real thoughts. I still think that, actually. In the event that my apartment building burns down, he’ll probably be the one thing I grab before I run outside screaming, because I wouldn’t want to leave him behind to a fiery death. Anyway, I got older, and Tim didn’t come everywhere with me anymore. My husband said he thought Tim was getting bored lying around the house all the time. 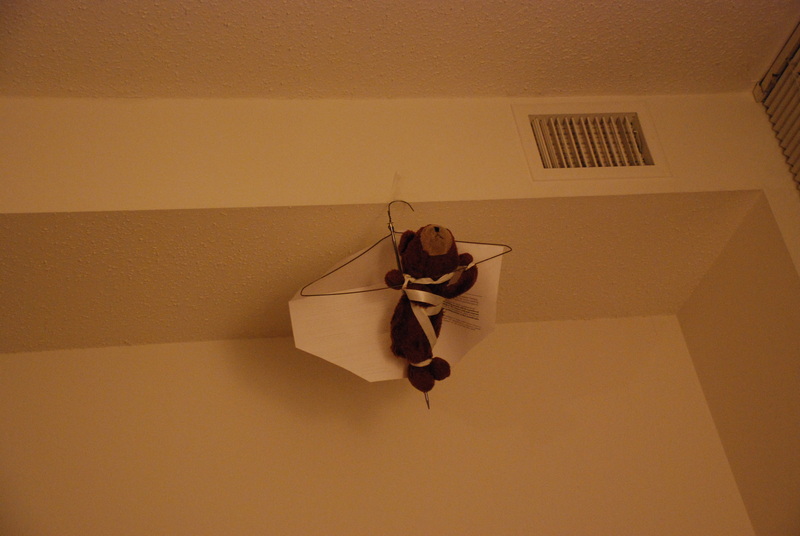 So one day, a few months ago, I came home to find that my husband had fashioned a hang-glider out of a wire coat-hanger, ribbon, a knitting needle and some paper, strapped Tim in, and hung him from the ceiling. “He’s decided to start living, babe,” my husband said, “and he’s got a lot of plans.” Naturally, I snapped a picture, and there was born The Adventures of Tim and Friends, or maybe I should say The Recent Adventures of Tim and Friends. I’m pretty sure they had some adventures in college, but those were the days before digital cameras. And thank god for that. That tape is still stuck to the ceiling, by the way. Everyone asks me why this is called The H-Less Wonder. My name is traditionally a name spelled with an “H” but my parents chose to leave it out. In college, my lack of an H was credited with everything from making me faster and more aerodynamic to being the reason I am just a little bit ridiculous. We actually used to converse about what the world would be like if there were no H’s, and we would frequently take te suttle from te metro to te residence all, after buying groceries at Wole Foods or renting movies from Ollywood Video. I had a slew of nicknames in college, but The H-Less Wonder was by far the best, and my best friend suggested I use it as the title of this little project of mine. It’s certainly better than naming it The Virgin of Anderson Hall.